Have you heard of Olive Lane? If you haven't, you need to have them on your radar! They have theeee cutest tees ever. They're such great quality, and so soft! Graphic tees have become such an "in" thing lately, and I always go to Olive Lane first if I'm looking for something new to put in my wardrobe. Brimley and I have been asked to be Brand Reps for Olive Lane, which means we style the shirts how we would wear them, have a mini photo shoot (because why wouldn't you?) and advertise their adorable products. 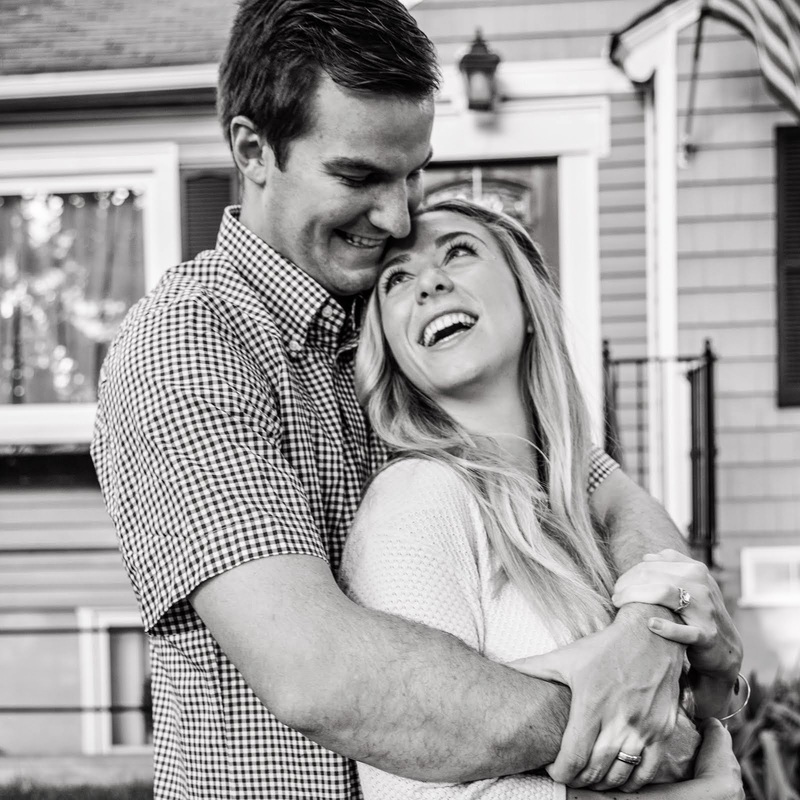 We are SUCH big fans of Olive Lane, and we are so excited for this fun opportunity! We only hope you enjoy our mini photoshoots as well! For this look, we modeled the "Need More Sleep" baseball tee, and A Little Dash of Darling's signature tee, "Bonjour Ma Cherie" which means "Hello, my darling"-so cute! After this shoot, I had already worn my "Bonjour Ma Cherie" shirt twice! I seriously love it, and as you can see, it can be worn lots of ways. I can't wait to wear it more come colder winter, and show it off under some layers! 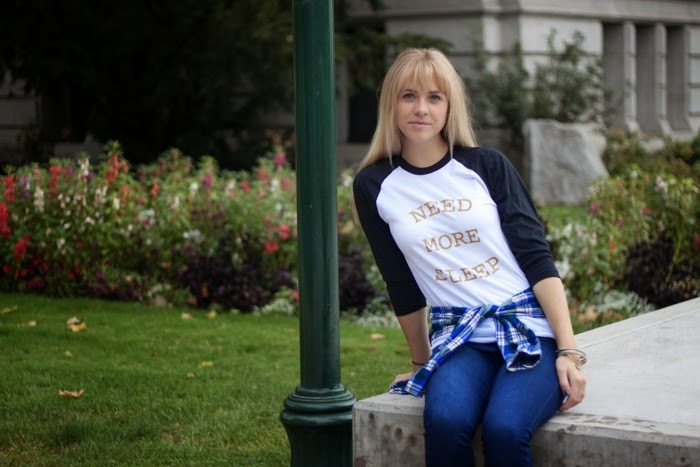 You can never go wrong with a baseball tee, and really, who doesn't need more sleep? I love this shirt as well, and I know I'll be wearing it with an unbuttoned flannel in the near future. 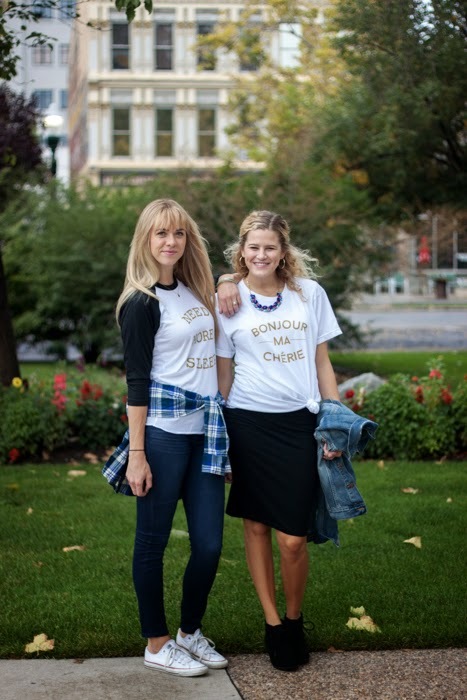 Take a look at these darling shirts, hop on over to Brimley's blog to see more pictures, and then once you realize how much you love and need them, head over to Olive Lane, and buy one for yourself! Brimley and I are wearing smalls in both tees! For the love. You two are so cute. Thanks!